As usual, the Staff at Regal Heights has shown tremendous spirit (and teamwork!) in our raising funds to benefit The Alzheimer’s Association. 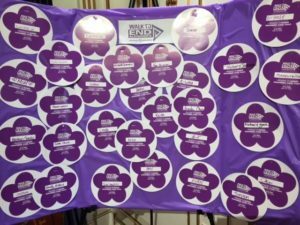 We raffled a very tempting candy basket assembled by BJ DiDonato, our Director of Community Relations, and our team made sure to join in, helping to raise funds and wearing purple: Just take a look at Nathalie from our Activities Department wearing her “Walk to End Alzheimer’s” shirt! 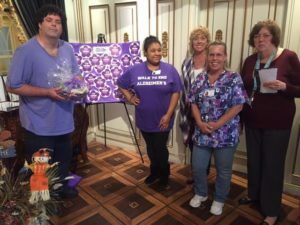 Take a look at the flower circles people purchased in our Front Lobby: ALL proceeds go to to benefit the Alzheimer’s Association. ← Raising Money for the Alzheimer’s Association!